A young teacher is brought in to help a deaf girl preparing for school improve her skills, The teacher begins to have success but ends up on a collision course with the girls parents who don't understand that there is much more to their daughter. This is a top shelf film on every level will break your heart with it's tale of parents who can't be bothered and schools unequipped to deal with the problem of deafness. No one seems to understand that with the right amount of attention and the right bit of help the young girl will be fine. Beautifully made I can completely understand how this ended up on the Oscar short list since the film looks and feels like a finely crafted feature. I was disappointed when the film ended after less than 20 minutes because there was still much to say. 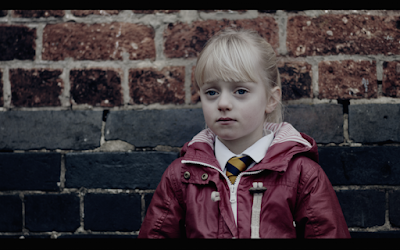 On the other hand THE SILENT CHILD does an excellent job of not only explaining what deaf children face but also what it feels like not to hear. Keep an eye out for this film and expect it to show up as an Oscar finalist.